You managed to royally kick our asses and at the same time provide us with one of the BEST memories of our entire trip. In case you're living under a rock, let me tell you about this majestic beast of a day trip about an hour and a half away from Barcelona. Once you reach the top of this mountain, you'll step out into a town with a monastery that will immediately have you drooling. One of the main attractions is the basilica, which houses a 12th century sculpture of the Virgin Mary and Jesus that draws massive crowds (seriously, the lines were crazy). The museum has collections including an Egyptian sarcophagus and art from around the world. Crowds get pretty crazy at Montserrat early on, so to avoid long lines at the RACK or cable car stations, plan to start your day early. *gasp* I almost booked a day trip from Barcelona for this excursion and I am SO glad I didn't. We were able to explore at our own pace and really take in the views without being rushed. Use Google Maps to plan out your timing to Montserrat. Trains leave from Plaça d’Espanya to Montserrat every hour on most days (check the schedule in advance for your exact date). When you get to Plaça d’Espanya, look for signs that say "R5 Manresa" or have the orange symbol seen here. There are ticket machines at the platform. You should buy a Montserrat ToT ticket if you're planning on doing the cable car + any funicular as the combined ticket will save you some $$. There are multiple tiers of tickets that will do the same or similar thing if that option isn't available at the machine. You need to decide on this in advance so you can choose which station to buy your ticket for at Plaça d’Espanya. If you want to take the cable car up, buy your Montserrat ticket to "Aeri de Montserrat". If you want to take the Rack, look for "Cremallera de Montserrat". The rack station is one stop further on the R5 train. The Cable Car up is a wild experience! I'd highly recommend doing this at least one way. In a perfect world, I would've wanted to take the Cable Car up in the morning and the Rack down afterward to avoid having to stand on the train home. We purchased round trip cable car tickets, so stand we did! If standing on the hour long train back to Barcelona is a no-go for you, then either pay for a one way ticket for each (cable car there, rack back) or just do a round trip Rack ticket from Plaça d’Espanya. 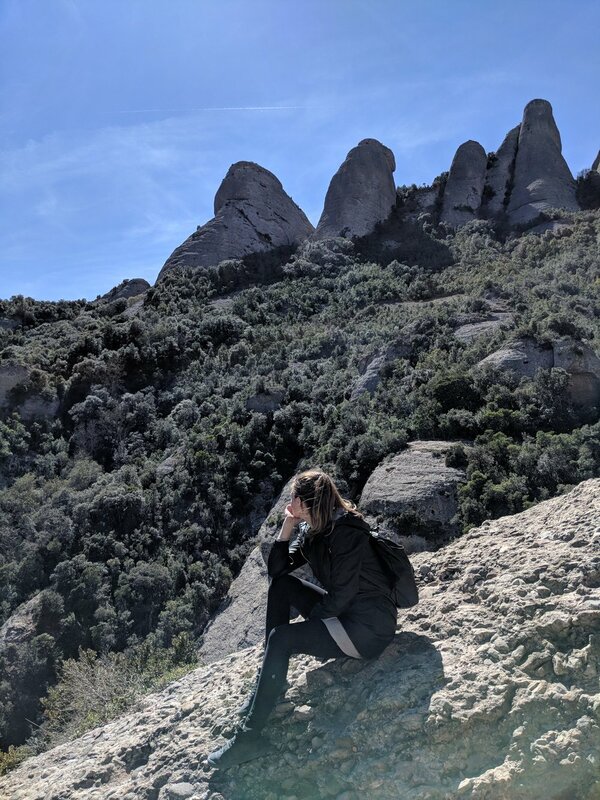 Let me tell you a quick story about the crazy hike we went on at Montserrat. Two knee surgery survivors set out to conquer this mountain, equipped with a map from the tourist office at the base of the Sant Joan Funicular and an excessive amount of Internet stalking to find the best route without a guide. We were ultra confident that we were going the right way, more so after seeing a French high school group head in the same direction as us. 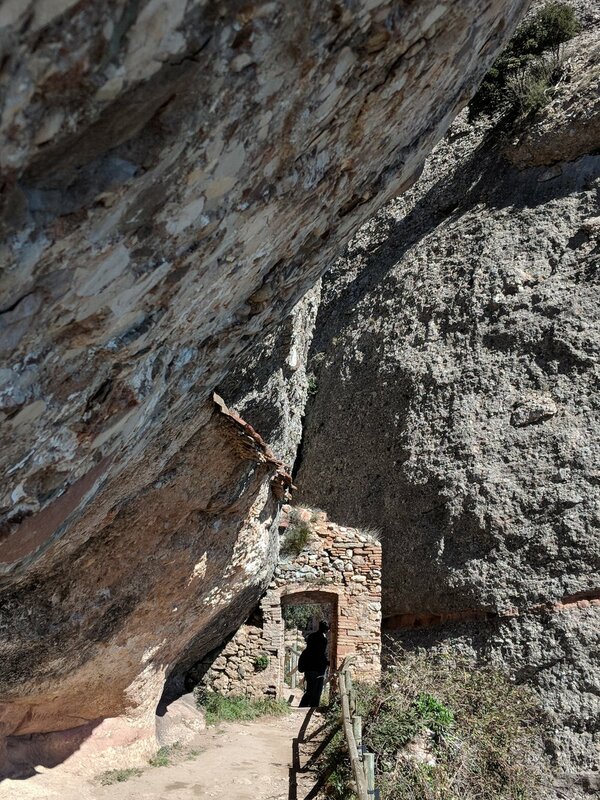 About an hour and a half in, after the most scenic snack break, we started second guessing ourselves and asked an outdoorsy looking guy who spoke a bit of English if the trail we were on was heading back to Montserrat. He gave us a resounding no and told us we had to go back about an hour to get on the correct trail. :| Major bummer, but we travelled back and asked for a second opinion. The second person said we were on the wrong path and that we should just go back and take the funicular down from where we started. Bummer again. We were DETERMINED to finish this hike and figure out where we went wrong (without missing the train back to Barcelona). We could visually see where we wanted to go at this point - where the stairs back down to the Monastery start - so we just had to find the right trail there. On a total fluke, we came across an unpaved side trail that seemed to be leading down to the lower level I wanted to access. Instinct was calling, even though it had taking a beating earlier that day. We said "let's give it 10 minutes in this direction and if it's not getting us there then we will head back to the funicular". Turns out it was a side trail to the correct path!! 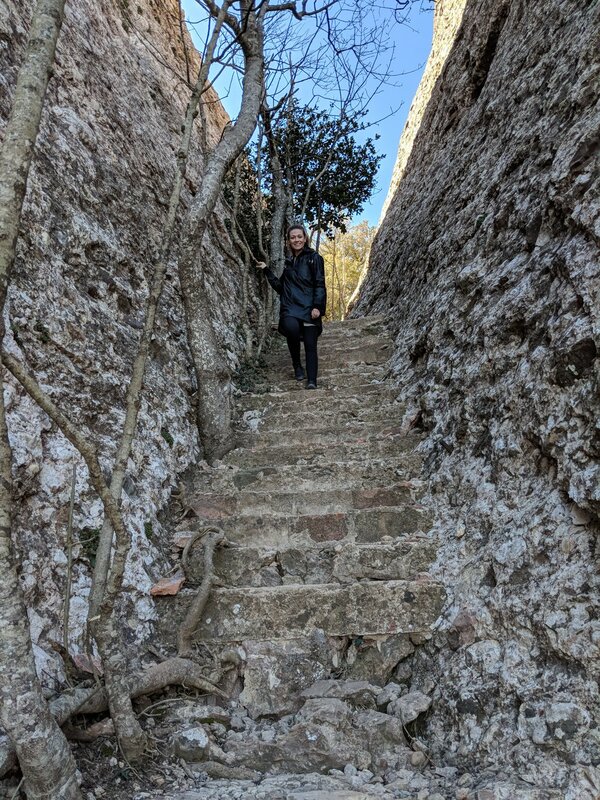 We were able to make it to the *very steep* stairs back to the Monastery and were truly happy campers to have conquered this hike after all. I wish I could tell you my exact route for our hike, but I still to this day can't figure out where we took a wrong turn! Even with the extra hour of a detour, we wouldn't trade the experience for anything. Don't be afraid to ask people that look like they know what's up for help. You can always go on guided hikes if you're hopeless with directions. 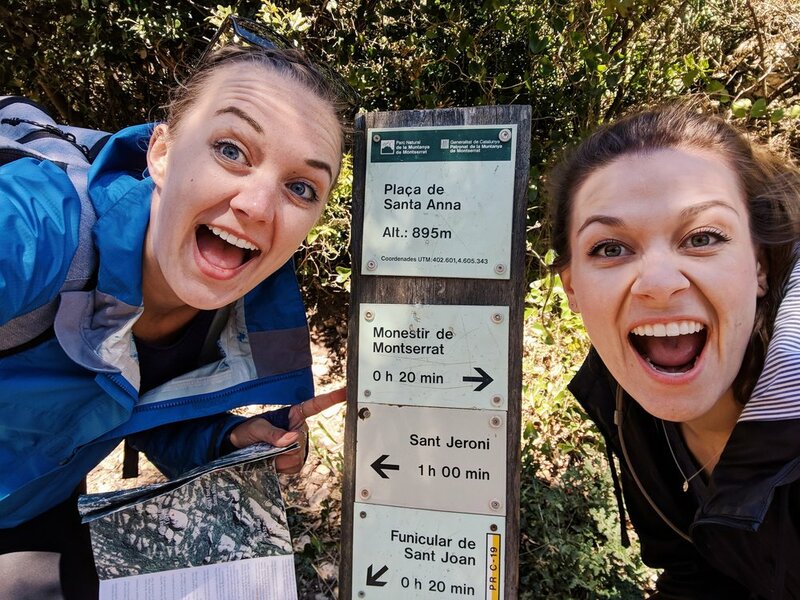 Kind of a given for any hike, but with the exception of our coffee-stop-slash-pee-break first thing in the morning, we didn't end up eating at Montserrat just for the sake of time. If you do want to eat there, there is a cafeteria, a restaurant, and a number of smaller outdoor vendors selling local produce. Still, make sure you pack water and some snacks if you plan on hiking! Plus, you'll want some noms on that long train ride home at the end of the day. I'm so happy we took a day to explore Montserrat and I wouldn't change a thing about our crazy adventure here!